You are the sum of the five people you hang around with most. In part one, I asked you to list the five influencers who are currently positively impacting you and your career. I also asked you questions to think about to help you determine who they are. Moreover, I explained it’s not about the quantity but rather the quality of people that you have in your life. Truthfully, there have been times in my life when I have hung around mostly with only one or two people. I didn’t have five all the time in my journey because I didn’t need them. I was happy with those who supported me and what I was accomplishing with them at my side. But as I grew as a person and changed, the people I spent time with changed also—except for my husband, of course. I met new friends and hired coaches to help me reach my goals. I found that, as we open ourselves up to new possibilities, we attract new teachers and allies to help us along the way. In this article, I will share with you five steps to help you find and attract such people. Once again, the number five is not etched in stone. It’s just a number to challenge us to think about who, in life, is in our corner, has our back, and provides an example for us to model. If you don’t have any or enough positive influencers in your life, there are ways to find them. No worries. First of all, ask yourself if you are fine with your life and your career and have enough people to support and encourage you. If your answer is yes, then you are all set. However, if your answer is no, then there are ways to gain more positive influencers in your life. Here are five steps (and a bonus step!) to get you started. These steps have consistently helped me in the past. 1. Who — Set an intention. Whether it’s finding a new mate, looking for a coach, or needing an accountability buddy, the clearer you are, the better. 2. What — Establish your needs. What area in your career do you want the new person to help or support you with? 3. Where — Locate the person or persons. If you know #2, then you will have a better idea of where to find people. 4. How — Follow-up. Forge relationships by following up with people you’ve met. Ask when you can meet up one-to-one. 5. Why — Share your big why. Once you’ve gotten to know each other, explain to your new connections your big “why” and ask what theirs are as well. This will deepen your relationships. The more you know about your new acquaintances, the more likely you will see if they are in alignment with who you are and what your dreams are. 6. Bonus — Tell them what they mean to you and thank them. After you meet with these people for a while, I encourage you to show your appreciation by letting them know how much they have helped you. It’s important to note that we are all on our own happiness and success journeys. That means that, even though you may have certain people in your top five, they may not have you as one of theirs. Don’t take this personally. It’s not about you. It’s about them and where they are in their personal and professional life. I wish you much success in this exercise. Be patient with this process as you find your next influencer. They are all worth the wait and the work you put into looking for them. I hope that this exercise helps you as much as it has helped me. If you are looking for a coach to help you reach your goals, contact me at info@HealthandHappinessSpecialist.com. 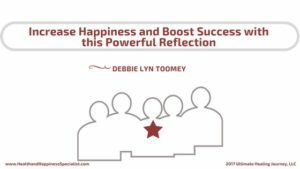 This entry was posted in Communication, Family, growth, happiness, Health, Intention, positive influence, Success and tagged family, happiness, health, life-work, relationships, success, teachers. Bookmark the permalink.